Correspondence between the mayor and city manager in 1998 confirmed that although Merced once had a flag, it was no longer extant. The mayor was authorized to proceed to have one designed. A competition was mentioned. Correspondence in 2000 reveals that a competition was announced and received 35 entries by 29 February. During the competition it became apparent that there was in existence a flag dating back to 1967, based on the city seal which dates from 1 April 1889. The flag contained a gold seal, symbolic of the Gold Rush, on a royal purple background (see former flag, below). The designer is unknown. Based on the 2000 competition, a new flag was chosen (shown above). The designer, Paul Vang, of Merced, was invited to be present at the unveiling of the flag on 18 December 2000. It is there referred to as a millennium flag. This flag has the primary colours, red, yellow and blue. The red and yellow flower was chosen to represent the "sunny side of Merced", while the blue stem represents the Merced River and Bear Creek. The judges commented "this flag celebrates the diversity of the community. The symbol of the cheerful flower shows the growth of our community and its economic development necessary for the new U.C. Merced. The flag expresses tremendous vitality and signifies forward thinking. The flag is uplifting and a perfect celebration for the new Millennium"
The flag was shown at the 15 May council meeting, presented at the 18 December council meeting and flown at City Hall on 1 January 2001. 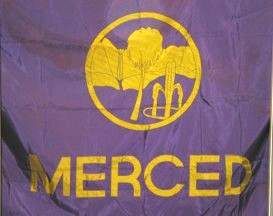 City of Merced Flag: First used 2001. Designed by Paul Vang, it was selected through a juried community competition at Mayor's request. Features abstract symbols. Used only as a flag, no other uses. Used only in color. Does not photocopy well. Officially adopted by Council on December 18, 2000. From http://www.ci.mercec.ca.us, the seal is in the standard circular format, with a gray outer ring, black internal fimbriation, and a thick black outer border. The top of the outer ring contains the words 'CITY OF MERCED, CALIFORNIA' in black block letters, with the word 'Of' in slightly smaller size. The bottom of this ring contains the words and date 'INCORPORATED APRIL 1, A. D. 1859', again in slightly smaller black block lettering. The central image of the seal is colored, however. A blue sky is at the top of the image, with a range of mountains in yellow beneath. A river colored white runs more or less horizontally across the center of the image. The banks of the river to the left of the image are lined by green vegetation. and there is also a green field to the lower left of the image. Arising vertically from this field is a tall tree with a dark olive green crown and a yellow trunk, distinguished from the surrounding yellow mountains by black bordering and which extends past the mountains into the sky. City Seal: First used in 1889. Unknown designer. Its primary intended use was to seal official documents; it came into more general use later on vehicles, on administrative reports to Council, and on other documents in a non-systematic way. It features Yosemite Valley, a palm tree, and a fountain. Usually used in black and white, although there is a color version which is slightly different. Does not reduce well and fuzzes out on photocopying. Adopted by Ordinance No. 16 in 1889, codified at MMC 1.08.010.